Perth Archbishop Timothy Costelloe with representatives from Perth at the Australian Catholic Youth Festival in Adelaide, which was held from 3 to 5 December 2015.Photo: Daniel Hopper/ACBC. The 2008 World Youth Day in Sydney changed the landscape of youth ministry nationally, the Australian Catholic Bishops have said as they launched the 2017 Year of Youth. The Year of Youth will celebrate the tenth anniversary of the 2008 World Youth Day and highlight how the Australian Church continues to tell the stories of faith in its local ministry. Launched last week, on Tuesday, 26 July in Krakow, Poland, together with 3,000 Australian young people who gathered for the opening celebrations of the 2016 World Youth Day in Poland, the event was attended by half of all Australian bishops with special guest, His Excellency Paul Wojciechowski, the Australian Ambassador to Poland. Hosted at the Mercy Centre in Tauron Arena, Krakow, the theme of the two-hour gathering was ‘Blessed are the Merciful’ and included music, catechesis and testimonials. Speaking about the Year of Youth, Australian Catholic Bishops Delegate for Youth, Bishop Mark Edwards, said the years of preparation leading up to World Youth Day 2008 have changed the landscape of youth ministry, leaving a lasting impression on the Church. “Local youth ministries have grown and diversified,” Bishop Edwards said. “The number of youth ministers has increased along with diocesan support structures,” he said. Director of the Australian Catholic Bishops Office for Youth, Malcolm Hart, said the Year of Youth will utilise the anniversary of WYD 2008 to highlight the impact a concerted effort and focus on young people have in the life of the Church. “The Australian bishops have established a three-year cycle of events to support and sustain youth ministry into the future,” Mr Hart explained. “This includes support and participation in World Youth Days, the engagement of a new generation of young Catholics through the Australian Catholic Youth Festival, and increased training and formation of those working with young people through the Australian Catholic Youth Ministry Convention,” he said. Following WYD08, the bishops established the Australian Catholic Youth Council as a strategic advisory body, and created an Office for Youth to implement the Australian Catholic bishops’ vision for youth ministry, Anointed and Sent. Josh Low with a fellow West Australian delegate at the 2015 Australian Catholic Youth Festival, held in Adelaide from 3 to 5 December 2015. Photo: Daniel Hopper/ACBC. Commencing the Year of Youth in Sydney, the Australian Catholic Youth Festival in December 2017 will be the largest national gathering of the Catholic Church in Australia with an expected attendance of 15,000. “Australia could well be one of the countries that has leveraged World Youth Day in its own country to the greatest potential,” Bishop Edwards said. 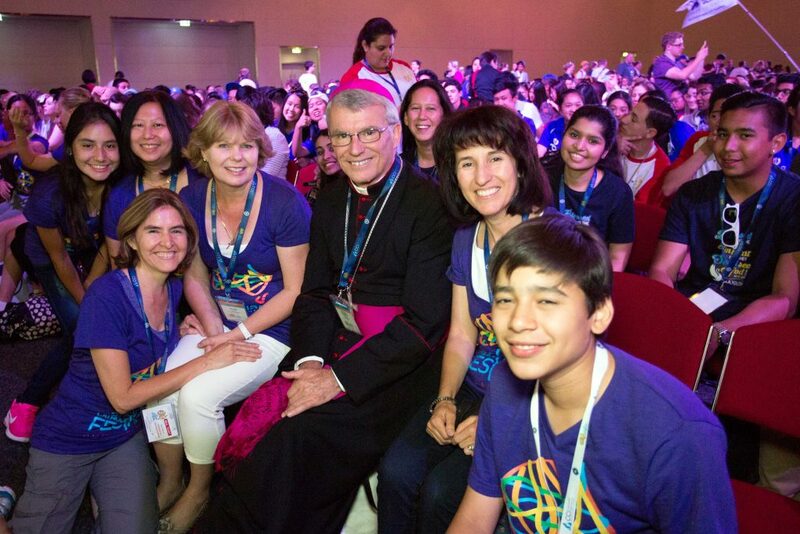 Bishop Edwards continued, saying that the anniversary of WYD08 provides an opportunity to refocus commitment to a three-year cycle of events setting a new standard for continuously renewing the Church’s mission of evangelisation in young people. Highlights of the launch of the Year of Youth and 2016 WYD Australian gathering included an inspiring call to action from Bishop Comensoli, an insight into ‘Polish and Australian Spirituality’ by Bishop Columba Macbeth-Green, an inviting homily preached by Bishop Patrick O’Regan, and music by Victorian priest, Fr Rob Galea. Prayers of the faithful were said in five different languages, representing the multicultural nature of the Church in Australia. Bishops Edwards concluded that, during the Year of Youth, it is crucial the Church engages with young people as a priority and re-affirms and sustains its work with them in the spirit of WYD08.